Dump trailers can be towed by a truck or other vehicle, filled with debris, tools, planting or building materials then lifted at an angle to spill the materials out without manual unloading. Most dump trailers are powered by a hydraulic pump that can be operated with a remote in newer models, a switch or button on the trailer itself. Unlike larger, more expensive dump trucks, dump trailers can be unhitched and left at a job site, however remote. An investment in the right dump trailer can save hours of costly labor. Size, capacity, height and configuration are all points to ponder when selecting a dump trailer. 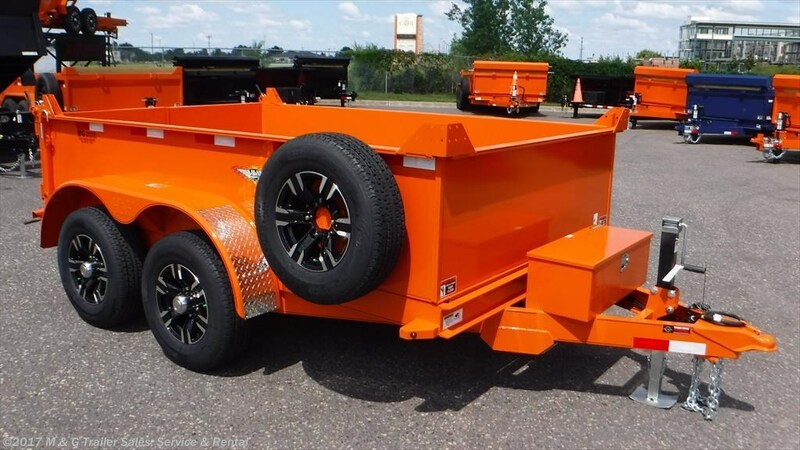 Look for dump trailers to be built as a bumper pull or gooseneck hitch with the bed above a deck or with the bed inside the wheels, to ride low, or above the wheels, for greater ground clearance. For greater ground clearance, traveling over uneven surfaces, and loads that are small to moderate in weight, consider a dump trailer built on straight axles with a bed that sits above and are in line with the tires. If hauling equipment, carts or mowers is on the duty list for your new dump trailer, consider a low rider or drop axle configuration, which allows the trailer to sit between the wheels for a lower ground. A drop axle is a good choice for hauling wheeled equipment and towing on even surfaces. For serious hauling with hefty loads, consider a deck over dump trailer, a trailer configured atop a stout trailer platform with the trailer tilting up, sometimes with a scissor lift, from the middle of the platform. Payload capacity is a weighty matter in dump trailer selection. Look at the Gross Vehicle Weight of any dump trailer you consider. The Gross Vehicle Weight is a combination of the trailer’s weight and the maximum weight the trailer can carry. Consider what your dump trailer needs to haul and the capacity of your towing vehicle, which will have its towing capacity listing in the owner’s manual. The smallest of dump trailers, those rated for less than 1,800 pounds, may be light enough to be towed behind a rugged four-wheeler for chores like clean up and grounds maintenance. Do-it-yourselfers, small businesses, and grounds keepers may find a light-duty dump trailer a suitable choice. 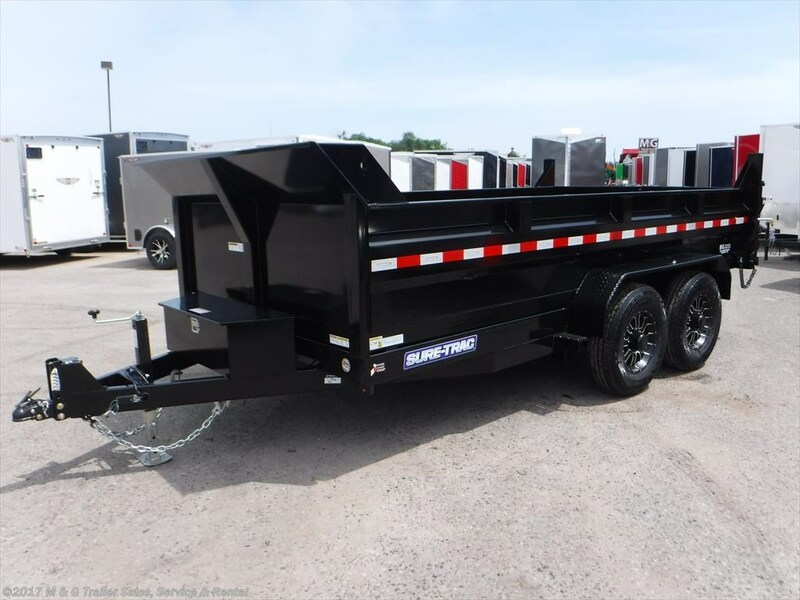 Light duty dump trailers are stout enough to tote equipment to a job site and will generally have a GVW of around 3,000 pounds. While not mandatory, light duty dump trailers may be equipped with an electric braking system. Heavy duty dump trailers may have a GVW of up to 20,000 pounds and will usually be equipped with electric brakes and dual axles. Heavy duty dump trailers can be up to 20 feet long and are a valuable tool for construction projects, industrial work, and farming. A dump trailer is a versatile addition to the work arsenal – replacing dumpsters in hard to reach project areas, saving hours of manual labor unloading dirt, gravel, mulch, and other loose material, able to carry and unload equipment, all while withstanding the elements. Find the right dump trailer at M&G Trailer in Ramsey, Minn., where a large selection of dump trailers from top manufacturers such as H&H, Sure-Trac, and Midsota are available to meet your needs.